...and more including Checklists, GANTT, Agile, RACI, and Risk Register. assignment and full collaboration with your team mates. Expand and collapse task trees anywhere in your WBS to display only the branch in your diagram that you are working on right now. Details for each task in your WBS are easily available from any task by clicking the "i" info button. Choose to display subtasks in list or expanded style separately for each parent task in your WBS chart. Building out your project's structure has never been so easy. In minutes create all of the project deliverables and their substasks. A WBS software that effortlessly generates project structure and deliverables. Generate your WBS online quickly, whether you created the tasks in WBS, GANTT, or any of the other views in the project management software. 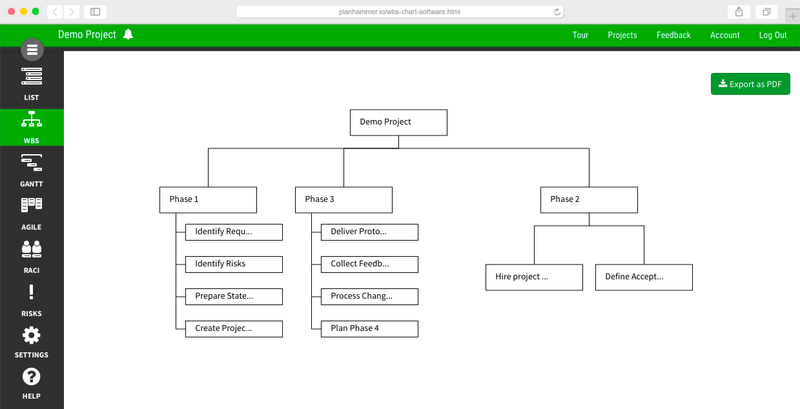 Generate your WBS diagram by breaking down your top level tasks in an intuitive project visualization which makes it natural for you or your project managers to focus on deliverables from the early stages of the project. Fully interactive, zoom and pan. As you work through your project's structure, switch between zoom levels so that the big picture is always kept in alignment whilst not letting the details slip or lose focus when getting in the flow. Expand and collapse subtask trees with a single click so that the work breakdown structure generated is showing only what is necessary for the task or viewer at hand. Print WBS as a PDF for offline viewing. Easily export your WBS diagram as a PDF to share with external users and deliver as hard copies at meetings and conferences.